The Riddle of the Sphinx – how conscious are you? The Riddle of the Sphinx goes like this: what animal goes on four legs in the morning, two legs at noon, and three legs in the evening? The sphinx was a creature with the body of a lion and the head and breasts of a woman. It sat above the rocky entrance to the city of Thebes in ancient Greece. 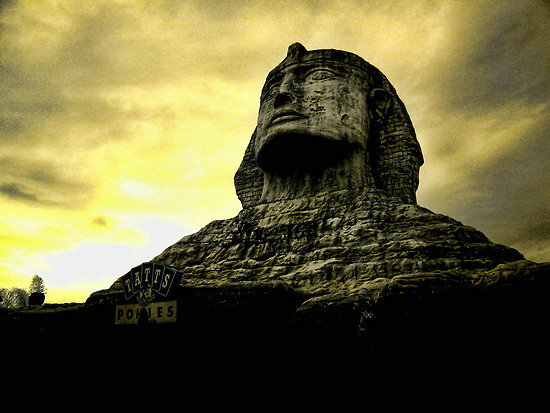 Whenever someone tried to enter the city, the sphinx would demand that he first answer this riddle. If he could not answer it, the sphinx would kill him and devour his body. But, if the traveler could answer correctly, the Sphinx would throw itself down from the rocks and die. The answer to the riddle was Man. (This is the generic man, which includes both men and women, that quality of soul that makes us both human and divine.) The answer is explained thus: in the morning of life, a person crawls on all fours, at noon on two feet, and in the evening with the help of a cane. Now, if that were the entire explanation, the Riddle of the Sphinx would only be a clever puzzle. But if we look deeper, with an eye towards symbolic meaning, we find that there is a deeper layer hidden beneath the obvious. In symbolic stories, whenever numbers play a prominent role, it is safe to bet that something is being veiled, something that can only be interpreted by those who have knowledge of the symbolic meaning of numbers. Of course, the Riddle of the Sphinx is an ancient story. The original author wrote it for an audience that understood symbolism, those who had been trained in the Mysteries. It stood as a verbal icon, a way of preserving a teaching without speaking of it too directly. After all, it is far easier to corrupt a philosophy with opinion than it is to corrupt a story. Stories appeal to everyone and are more likely to survive through the ages intact. The Riddle of the Sphinx is a mythical story, which means that all of the characters, along with the setting and the action, represent aspects of one person – us. It is a story about the evolution of consciousness, the natural progression from one state of awareness to another, the transitions in life that raise us to new levels of understanding ourselves and the world. When such a transition occurs, we say to ourselves, “I feel different.” Mythic stories are the maps that lead us to this higher ground. Our consciousness evolves from the four-legged stage of a baby to the two-legged stage of an adult to the three-legged stage of the elder. What does this mean? The answer lies in the symbolic meaning of the numbers 4, 2, and 3. Four has always meant the physical world and our consciousness of it. We can live many lifetimes fine-tuning our awareness of the environment and developing our ability to survive in it. We all know people who are good at this. Their chief concerns are home, family, and career. Their moral philosophy emphasizes loyalty to one’s immediate group, the sanctity of the bonds that hold that group together, and the strict adherence to an established code of conduct with the implicit rightness of the rewards and punishments that go along with it. The individual is expected to sacrifice him or herself to these values and to obey the letter of the law. Inwardly, the same rules apply. When our consciousness is preoccupied with survival, we tend to adapt ourselves without question to the thinking of those around us. We believe what we are told to believe, value what others value, and speak the local language using the moral vernacular of the day. We only allow ourselves to think the thoughts that have already been articulated, seeking our wisdom from those around us, and regarding our own intuitions with deep suspicion. Our distrust of our own inner self is so severe that we regard it as evil, like a Pandora’s Box that we must never open, lest we bring destruction not only on ourselves but on our society as well. As we approach the transition between this stage of consciousness and the next, we begin to experiment with creativity and innovation. It is then that we start to refer to this inner evil as our “demons,” lending them a probationary legitimacy while we learn to swim in their unfamiliar waters. This is the symbolic meaning of the number 4 and the stage of consciousness it represents. Next comes the two-legged stage of the adult. The number 2 symbolizes duality and reflection – the intellect. A is different from B. In society, this is where the concepts of justice and equality before the law come in. It is also where time-honored “truths” are brought into question and we begin to apply logic to our preconceived notions of reality. Our moral philosophy expands to include the mind as an active participant in how we structure our society. Tradition begins to take a back seat to Rational Thinking, and the concept of “progress” takes center stage. No longer do we govern ourselves strictly according to precedence. Now we are open to reform. Adaptation becomes the moral imperative, and those of us who are best at solving problems are rewarded the most. Thus, intelligence becomes the highest virtue, and we shift our loyalties from the old to the new, from the past to the future. Inwardly, as our intellect awakens and we see that there are two sides to every story, we begin to weigh the merits of our thoughts according to their efficacy in the world and not whether they conform to our assumptions. A powerful idea is an idea that works. Old gods are torn down and the new god of Rationality becomes the standard. Every truth can be ascertained through the faculty of reason, and we need not rely on faith or blind acceptance anymore. As adults, we are free from dependency on our “parents,” and we are now capable of discerning truth for ourselves. We stand on our own two feet. We stand or fall on our ability to think rationally. This is the age of ideology. Its emphasis is on comparison, where the better of the two ideas being compared becomes the “good,” and the other idea becomes the “evil.” It is black-and-white thinking. Something is either right or wrong with very little gray in between. At best, this way of organizing our thoughts is rational and philosophical; at worst, it devolves into stubborn opinion. In either case, it is outer-directed, basing truth on what can be observed with our physical senses aided by our ability to draw logical connections between seemingly different phenomena. This is the symbolic meaning of the number 2 and the stage of consciousness it represents. Finally, we come to the three-legged stage of the elder. Whereas the two-legged stance of the adult signifies a full-blown, independent maturity, the waning vitality of the elder, evidenced by having to use a cane, symbolizes a shift in orientation. The new orientation is toward the unknown territory of death. In old age, we are caught in the grip of the inevitable. We move towards a new dependency, not the worldly parents of our infancy, but the other-worldly parents of a new life beyond the grave. We have no choice. We will die just as surely as we were born, and the death will be a new birth, but into a world we do not know. In the uncertainty of our existence, we see the world we live in anew. Tradition and rationality begin to lose their solidity. Everything gets permeated with an inner luminosity, and what before seemed to divide one thing from another now blends them together into a dynamic whole. First, one side rises in its prominence and then the other, seesaw fashion, each balancing out the excesses of the other. Ideologies become as night and day, phases of larger cycles, each dependent on its polar opposite for its eventual meaning. Our inner life reaches this same stage of wisdom and dependency on the unknown. We move from certainty to uncertainty, but our uncertainty makes us wise. The smartest and wisest among us have always said that the more they think they know, the more they realize how much they don’t know. And the wisest amongst these know that real truth cannot as yet even be imagined. When we reach this stage of our inner evolution, we are less apt to come down on either side of an issue. We aren’t as ready to call one thing good and another thing bad. We see the world not only as a constantly changing, dynamic system but as a system whose inherent opposites are merely two ends of a continuous spectrum, that all opposites spring forth from a common unity. Dark becomes the absence of light and not a thing in itself. Evil is the absence of good, ignorance the absence of intelligence. We see that everything is good but to varying degrees. The world ceases to seem overburdened with strife, but rather as travailing in the birth-pangs of its own burgeoning potential. As we let go of our dependencies on the traditions that shaped us, and we learn to think for ourselves and take responsibility for our actions, and as we eventually let go of our best reasonings and dependence on logic and what our senses tell us is real (what is the same and what is different) the more we come into the knowledge of our true selves, the reflection of the Divine that we are. Just as the ancient traveler sought entrance into the mythical city, so do we seek to enter into this ultimate knowledge of reality. But before we can do so, we have to grow up and then grow beyond our grownup-ness. We have to embrace the unknown and step out into the uncharted territories that lie within us. Only then can we open up to the reality that is larger than ourselves – that is always larger than ourselves – and enter into that world of wholeness and everlasting life. 9 Responses to The Riddle of the Sphinx – how conscious are you? I have sensed this most of my life, but you put into clear perspective. I can speak experientially to the 3rd stage, because, though not so old, I use a cane for balance. I call it my wisdom-stick. MIchael, I really like the parallel with the emphasis on numerology. This is a cool and deep perspective on maturing and getting better connected within. At least, that’s how I took it. It’s wonderful to see the stages of life so clearly before me. I know I have gone through all of these stages and it seems that our society is doing the same thing collectively. I also really appreciate your skill as a writer. Hopefully I will be able to write as well as you some day. Thanks, Kenny. Learning to write has been a real journey. Lots of study and practice! If you’re interested, I can give you the names of books that have helped me most. Email me at michaelmaciel@mac.com. Reblogged this on Echoes from the Silence.